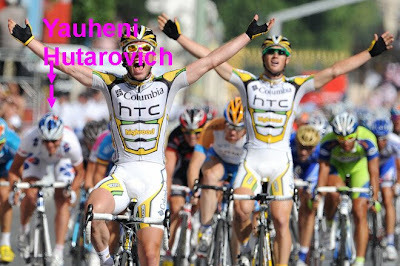 Congratulations to Yauheni Hutarovich, the Lanterne Rouge of the 2009 Tour de France, for his 5th place finish on the Champs d'Elysees today! That boy can sprint!! Well done indeed and a memorable finish to your Tour! I hear that Hutarovich "... celebrated that fact [of his Lanterne Rouge standing] with a red hand towel stuck in the back of his helmet during today’s final stage" but I haven't yet seen a photo of it. Anyone? Thanks, Laurie Beth! mmmm, your wine picks look yummy!! Did you ever see such an uncomfortable podium as that? I'm sure Andy and Lance are okay with each other, but Contador clearly had no use for either of them, nor them for him, and Lance couldn't wait to get off the steps. I predict a future of obscurity for Contador. Frankly I don't believe he could have won this year without Lance, Levi, Andreas, and Popo. It'll be interesting to see who'll want to ride with him. We have a new lantern rouge champion in Yauheni. You're right Nancy, he's got game too. Yeah, no way is Contador headed to obscurity. 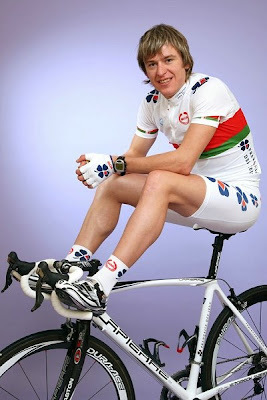 The guy is the best racing cyclist in the world by a fair margin. He would benefit from picking up on Lance's tactical superiority, but nobody can challenge him physically right now. Thanks for the blog; it was enjoyable. Hopefully there will be more videos and such next year.. hearing about these guys is a nice change of pace from the typical press.